Stephen Dee in Charlie Byrne's with one of his pieces. Galway’s second Cartoon Festival kicks off this weekend on Saturday, and last year’s little acorn has already had an impressive growth spurt. Last year the festival was confined to two venues, whereas this year’s event features work by more than 70 cartoonists from all around the world which will be on show in a minimum of eight locations across the city. One of the major themes of this year’s event is the centenary of the end of World War I and the festival will present a major international exhibition entitled A Peace to End All Peace (in the Black Gate Cultural Centre ), as well as a conference exploring the impact of cartoons during WWI in Europe to be hosted by NUI Galway in collaboration with the French department and the embassy of Belgium. The conference will feature Prof Grace Neville of UCC, recipient of the Légion d’Honneur, who will discuss the influence of press cartoons in Ireland after 1916. Philip Dine of NUI Galway will explore the post-Armistice world order as portrayed in Hergé’s famous Tintin adventures, while Coralline Dupuy will focus on the politics of gender representation in French-speaking cartoons during WWI. French Honorary Consul Catherine Gagneux will give a presentation on the rise, use, and influence of cartoons since WWI, using original drawings that will be part of the exhibition. Special guest, renowned Belgian comic artist Jean-Claude Servais, will explain the creative process behind his work, with an emphasis on stories set during WWI. This presentation is sponsored by the Belgian Embassy and Wallonie-Bruxelles International. The festival will also feature a major retrospective devoted to the work of Graeme Keyes in the Town Hall lobby. Keyes is one of Ireland’s funniest and most popular cartoonists. 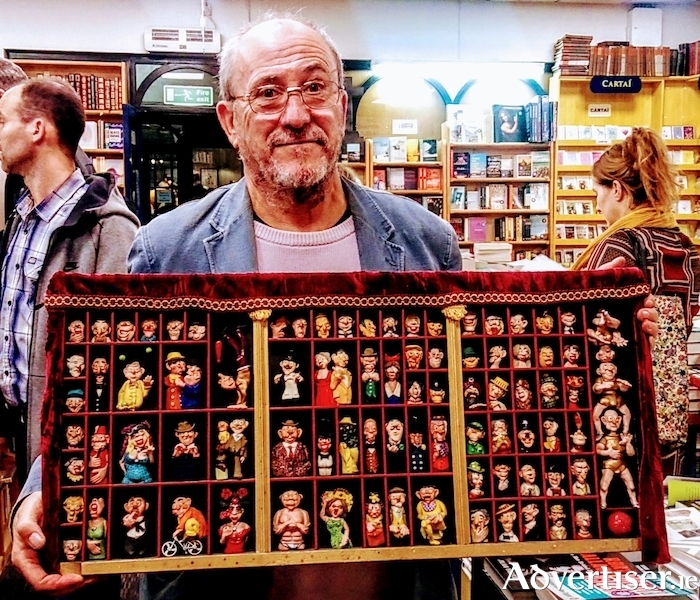 His work appears regularly in Private Eye and Phoenix magazines and he is currently the editorial cartoonist at the Irish Daily Mail and Irish Mail on Sunday. As well as drawing, Graeme has written scripts for satirist Oliver Callan and is responsible for many of those Private Eye and Phoenix word-bubble covers that we all love. Graeme himself will be along to do a few drawings and say a few words. “Graeme has been around for so long, he was in The Phoenix from the start of the magazine and was its main cartoonist for a long time,” Richard observes. “He is one of the most prolific cartoonists in the country and he has never stuck for a funny idea or a pun, he is a gag machine. Something a little different is the work of 3D artist Stephen Dee whose porcelain caricatures of the famous and infamous, as well as his ‘Sculptories’ – where he uses antique wooden printers’ trays to house tiny porcelain figures to form a narrative, rather like a strip cartoon will be displayed in the windows of Tigh Neachtain and Charlie Byrne’s Bookshop as part of the festival’s Cartoon Trail. The trail will also feature the festival’s youngest artist, 12-year-old Jack Tyaransen from Salthill. Jack has already had his work published in The Beano - twice - and is clearly a young comic artist whose name we will be hearing more of in the future. Romanian cartoonist Florian Doru Crihana has created two oil paintings specially for the festival. “One of the paintings will be of the Spanish Arch and the other Renmore Barracks as they both were in 1918; he managed to find old photographs to work from,” Chapman reveals.